I guess this would be her last time attending the Nikko Toshogu Grand Spring Festival. For more photos from the festival, please see this post and this post and even this post. I feel a lot of message from this picture: love, care, attention...Nice BW picture. A photo full of meaning and feelings. there is warmth here. I hope she found blessing, along with those who care for her. Fine and moving photo. considering how difficult it is to move around the temple complex in a wheelchair (actually, until now I thought it impossible), I really admire the determination of her carers. What a fabulous capture! I love these little shots of other's lives. I admire th0se who t0ok care of her to attend her last visit to spring festival.it is n0t easy t0 care s0me0ne in a wheelchair,kud0s t0 them! Touching photo. 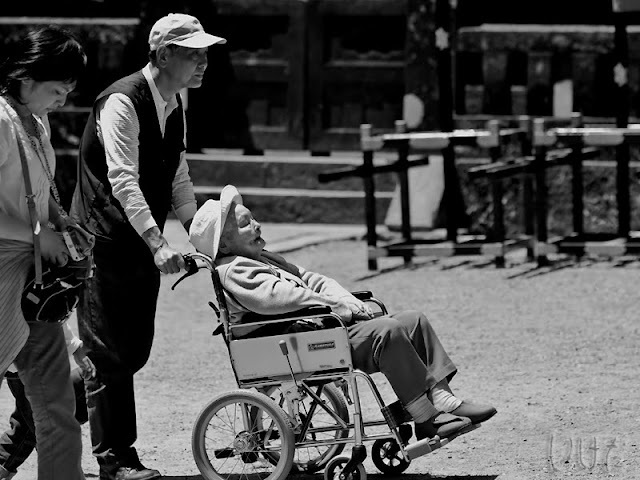 We should all be so lucky as to have devoted caregivers when we are so very old.